Iconic One is a premium quality WordPress theme with pixel perfect typography that is pleasing to the eyes. It offers a great combo of presentation and functionality in a neat package. Iconic One implements proper SEO so that your content will rank high and is compatible with AIOSEO and Yoast SEO. It uses H1 tags for posts and page titles and doesn’t use headings in sidebar so that you can creatively use headings in your articles. 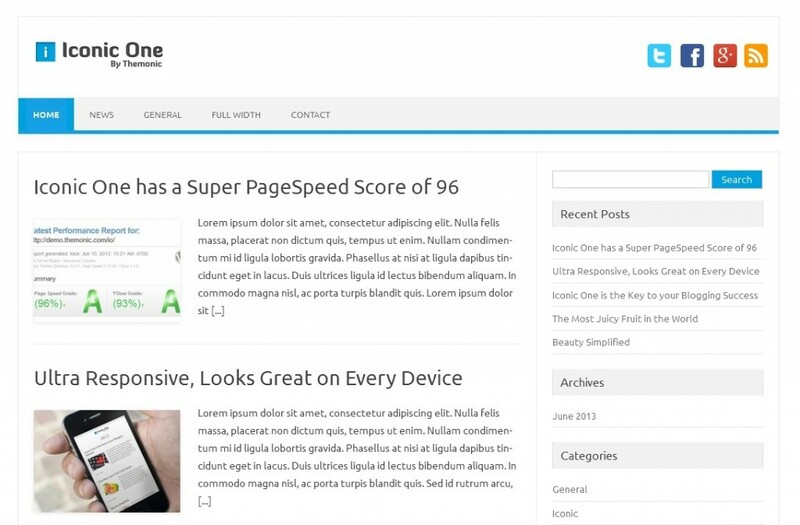 Iconic One utilizes latest HTML 5, CSS3 for creating the awesomeness that looks great on every browser. It adapts to screen size on different devices be it mobile, tablets or desktop and is future ready. Check out the demo on different devices to get the feel of it. Use the Live Customizer to change the logo image, social bookmarks, background color, footer copyright etc., you don’t have to touch any code or login to ftp for the most needed customizations. Sidebar is Widget ready for easy configuration. Built to be exceptionally fast with PageSpeed score of 95+, your visitors will be able to enjoy your content without waiting. Q ) Menu on mobile devices does not appear/ Menu not working on iPad? A) Select your menu as Primary Menu by going to Appearance -> Menus. If your blog is brand new then create a new menu and assign it as primary menu. Q ) What are the Logo size requirement? A) You can easily try uploading logos of different sizes via live customizer, bigger logos are also supported. Logo of 187 x 54 pixel dimensions is used in the demo. Q ) Homepage images are not showing? A) You have to set a featured image in your posts for the home page images to work. If you are switching from another theme, regenerate your thumbnails using a free plugin “Regenerate Thumbnails”. Q ) How to change “Custom Text Right” in the Footer? A) This setting is present in Live Customizer, go to Appearance -> Customize -> Footer. Here you can edit both left and right custom footer text. Q ) Theme Settings are not saving in Live customizer? Logo save not working? A) Simply Disable all plugins, change Theme Settings and then Enable plugins again. – Updated Google Font scripts. – Updated WordPress repo subject tags. Note: If you are using v 1.9 you can skip this version. * Setting Excerpts to default on home like before for existing users. Last commit didn’t work as expected. * Fixed the minor translation Warning caused by the latest Theme Check plugin update. * Fixed Jetpack Top Posts Widget styling issue. * Added iconic-one.pot file in /language folder for worldwide translation with a mini tutorial in the same folder. * Better styling for below title meta. * Removed current page highlight from the sidebar. * Minor Search bar responsiveness margin fix at width below 1040px. * Tested with WordPress version 3.6. * Urgent update due to extra </div> in the footer from the last update 1.2, it broke the footer completely. * Replaced Category with pages in sidebar if no widgets are defined. * Removed left-right border from sidebar elements. * Better looking sidebar search bar. * Added live customizer link in the Appearance menu for ease of access. * Minor Options page style change. * Minor menu style changes. A really decent theme, easy to setup, customize and does what it says on the tin. How to change Nav bar color? If you upgrade to Pro version you do not need the above as it has Color Picker for easy changing of colors. How to change Search widget background? How to change site width? How to change width of content and sidebar containers? The code below will increase sidebar size by 2%. Use these codes in Additional CSS section in live customizer or Iconic One child theme, the latter is recommended as you can safely update your theme without affecting your customization changes. Make sure you empty browser cache to reflect the most recent CSS customization. Temporary disable caching plugins too when you are customizing your site to view immediate visible changes. Do you want a simple starter child theme for Iconic One that is ready for customization? then download it from the button given below. This child theme is the latest 2019 release which doesn’t use the import function. How to use Iconic One Child theme? Your Custom CSS would go in style.css of this child theme and will load in front end after the parent Iconic One theme style.css for wide compatibility. Similarly, your custom php functions and code will go in functions.php. You can freely try customizing without the risk of damaging the site installation with child themes. If anything goes wrong, simply delete the child theme and start over. Iconic One has just crossed 550,000 downloads, totally with the word of mouth recommendations. Download it now to see how it can help you by increasing traffic and revenue.